One of the largest bird species in the arctic, the adult snowy owl can be more than 2 feet tall at maturity with a wingspan of more than 4 feet. Chicks begin life tucked into a white egg about 2.2 inches long, the size of a large chicken egg. At hatching, a muddy brown chick roughly the same size as a newly hatched chicken emerges from the egg. 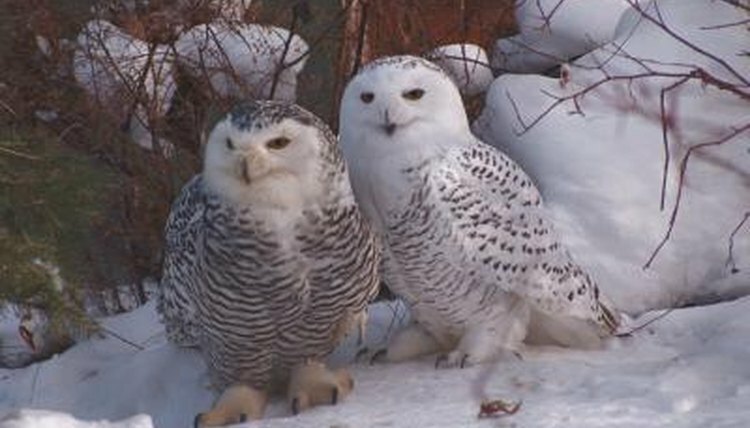 Unlike chickens, the mother snowy owl begins to incubate her eggs the day she lays the first one, continuing to lay eggs until she has a collection of up to a dozen. A month later, the snowy chicks begin to emerge one by one, every day or so. The chicks weigh about 45 grams when they hatch, and develop at a rate of nearly 3 grams per day until they reach their adult weight of 2,043 grams (4.5 pounds) at 730 days.